I worked on the Exploratory Committee on New Media for COEHS. My primary task was to evaluate, budget and design the pilot courses that could be used for integrating and rolling out iTunesU for a 15,000+ campus at WIU. 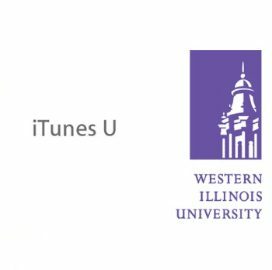 This work effectively interconnected Faculty, Staff and Students from 13 academic departments of the College of Education and Human Services (COEHS) of Western Illinois University (WIU) in the pilot rollout of the iTunes U podcasting service to campus. I provided blended training for faculty in 1:1, group, and online modalities. I also co-created a strategic plan to consolidate our portfolio of Content Management Systems (Blackboard, WebCT Vista, Moodle and now iTunes U) with intense focus in Accessibility, Usability and Simplicity. Note: COEHS was the pilot College at WIU in 2007.